Moderator Note: Given that this question has already had sixty-seven answers posted to it (some of them deleted), consider whether or not you are contributing anything new before posting another one. This operation never changes any of your own local branches under refs/heads, and is safe to do without changing your working copy. I have even heard of people running git fetch periodically in a cron job in the background (although I wouldn't recommend doing this). In its default mode, git pull is shorthand for git fetch followed by git merge FETCH_HEAD. When you use pull, Git tries to automatically do your work for you. It is context sensitive, so Git will merge any pulled commits into the branch you are currently working in. pull automatically merges the commits without letting you review them first. If you don’t closely manage your branches, you may run into frequent conflicts. When you fetch, Git gathers any commits from the target branch that do not exist in your current branch and stores them in your local repository. However, it does not merge them with your current branch. This is particularly useful if you need to keep your repository up to date, but are working on something that might break if you update your files. To integrate the commits into your master branch, you use merge. Git was designed to support a more distributed model with no need for a central repository (though you can certainly use one if you like). Also git was designed so that the client and the "server" don't need to be online at the same time. Git was designed so that people on an unreliable link could exchange code via email, even. It is possible to work completely disconnected and burn a CD to exchange code via git. In order to support this model git maintains a local repository with your code and also an additional local repository that mirrors the state of the remote repository. 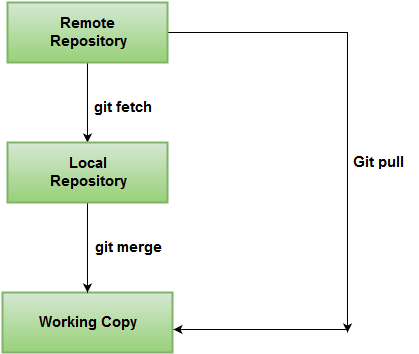 By keeping a copy of the remote repository locally, git can figure out the changes needed even when the remote repository is not reachable. Later when you need to send the changes to someone else, git can transfer them as a set of changes from a point in time known to the remote repository. git fetch is the command that says "bring my local copy of the remote repository up to date." git pull says "bring the changes in the remote repository to where I keep my own code." Normally git pull does this by doing a git fetch to bring the local copy of the remote repository up to date, and then merging the changes into your own code repository and possibly your working copy. It cost me a little bit to understand what was the difference, but this is a simple explanation. master in your localhost is a branch. If you do a git fetch it will just fetch all the changes in the remote repository (GitHub) and move the origin/master pointer to HEAD. Meanwhile your local branch master will keep pointing to where it has. If you do a git pull, it will do basically fetch (as explained previously) and merge any new changes to your master branch and move the pointer to HEAD. Sometimes a visual representation helps. git fetch is similar to pull but doesn't merge. i.e. it fetches remote updates (refs and objects) but your local stays the same (i.e. origin/master gets updated but master stays the same) . Also, git branch -a will show you exactly what’s going on with all your branches - local and remote. and covers git pull, git fetch, git clone and git rebase. I thought I'd update this to show how you'd actually use this in practice. On step 2: For more on diffs between local and remotes, see: How to compare a local git branch with its remote branch? On step 3: It's probably more accurate (e.g. on a fast changing repo) to do a git rebase origin here. See @Justin Ohms comment in another answer. The short and easy answer is that git pull is simply git fetch followed by git merge. It is very important to note that git pull will automatically merge whether you like it or not. This could, of course, result in merge conflicts. Let's say your remote is origin and your branch is master. 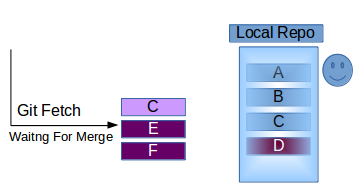 If you git diff origin/master before pulling, you should have some idea of potential merge conflicts and could prepare your local branch accordingly. Fetch branches and/or tags (collectively, "refs") from one or more other repositories, along with the objects necessary to complete their histories. Remote-tracking branches are updated (see the description of below for ways to control this behavior). By default, any tag that points into the histories being fetched is also fetched; the effect is to fetch tags that point at branches that you are interested in. This default behavior can be changed by using the --tags or --no-tags options or by configuring remote..tagOpt. By using a refspec that fetches tags explicitly, you can fetch tags that do not point into branches you are interested in as well. git fetch can fetch from either a single named repository or URL, or from several repositories at once if is given and there is a remotes. entry in the configuration file. (See git-config1). When no remote is specified, by default the origin remote will be used, unless there’s an upstream branch configured for the current branch. The names of refs that are fetched, together with the object names they point at, are written to .git/FETCH_HEAD. This information may be used by scripts or other git commands, such as git-pull. should be the name of a remote repository as passed to git-fetch1. can name an arbitrary remote ref (for example, the name of a tag) or even a collection of refs with corresponding remote-tracking branches (e.g., refs/heads/:refs/remotes/origin/), but usually it is the name of a branch in the remote repository. Default values for and are read from the "remote" and "merge" configuration for the current branch as set by git-branch --track. git fetch just "downloads" the changes from the remote to your local repository. git pull downloads the changes and merges them into your current branch. "In its default mode, git pull is shorthand for git fetch followed by git merge FETCH_HEAD." Before pushing your new commits to server, try this command and it will automatically sync latest server changes (with a fetch + merge) and will place your commit at the top in git log. No need to worry about manual pull/merge. I like to have some visual representation of the situation to grasp these things. Maybe other developers would like to see it too, so here's my addition. I'm not totally sure that it all is correct, so please comment if you find any mistakes. you are asked for decisions. will update the origin. In git, a commit is only done to your local repo. Synchronizes your changes back into the origin. Feedback about the state of your local repo (for example, I use Atlassian's SourceTree, which will give me a bulb indicating if I'm commits ahead or behind compared to the origin. This information can be updated with a GIT FETCH). I have struggled with this as well. In fact I got here with a google search of exactly the same question. Reading all these answers finally painted a picture in my head and I decided to try to get this down looking at the state of the 2 repositories and 1 sandbox and actions performed over time while watching the version of them. So here is what I came up with. Please correct me if I messed up anywhere. Let's take an example that you are working on a project with your team members. So their will be one main Branch of the project and all the contributors must fork it to their own local repository and then work on this local branch to modify/Add modules then push back to the main branch. Now, you have started working on the new module (suppose D) and when you have completed the D module you want to push it to the main branch, But meanwhile what happens is that one of your teammates has developed new Module E, F and modified C.
So now what has happened is that your local repository is lacking behind the original progress of the project and thus pushing of your changes to main branch can lead to conflict and may cause your Module D to malfunction. 1. Git Fetch- This will Download all the changes that have been made to the origin/main branch project which are not present in your local branch. And will wait for the Git Merge command to apply the changes that have been fetched to your Repository or branch. So now You can carefully monitor the files before merging it to your repository. And you can also modify D if required because of Modified C.
2. Git Pull- This will update your local branch with the origin/main branch i.e. actually what it does is combination of Git Fetch and Git merge one after another. But this may Cause Conflicts to occur, so it’s recommended to use Git Pull with a clean copy. So in the Git Gui, when you do fetch, you have to merge the data. Fetch itself won't make the code changes at your local. You can check that when you update the code by fetching once fetch and see; the code it won't change. Then you merge... You will see the changed code. git fetch pulls down the code from the remote server to your tracking branches in your local repository. If your remote is named origin (the default) then these branches will be within origin/, for example origin/master, origin/mybranch-123, etc. These are not your current branches, they are local copies of those branches from the server. git pull does a git fetch but then also merges the code from the tracking branch into your current local version of that branch. If you're not ready for that changes yet, just git fetch first. You download changes to your local branch from origin through fetch. Fetch asks the remote repo for all commits that others have made but you don't have on your local repo. Fetch downloads these commits and adds them to the local repository. You can apply changes downloaded through fetch using the merge command. Merge will take the commits retrieved from fetch and try to add them to your local branch. The merge will keep the commit history of your local changes so that when you share your branch with push, Git will know how others can merge your changes. Fetch and merge run together often enough that a command that combines the two, pull, was created. Pull does a fetch and then a merge to add the downloaded commits into your local branch. Copying new commits from remote branch to copy of this remote branch inside local repo. Fork local branch after last common ancestor and add new commits parallel to commits which are unique to local repository, finalized by merging commit, closing the fork. Insert new commits after last common ancestor and reapply commits unique to local repository. The commands above mean that download latest version of the main branch from origin from the remote to origin master branch. 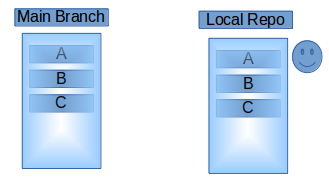 And then compares the local master branch and origin master branch. Finally, merge. git pull: Git is going to get the latest version from the remote and merge into the local. The command above is the equivalent to git fetch and git merge. In practice, git fetch maybe more secure because before the merge we can see the changes and decide whether to merge. What is the difference between git pull and git fetch? 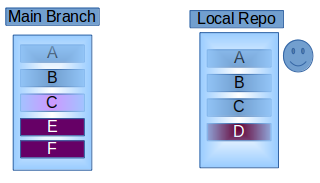 To understand this, you first need to understand that your local git maintains not only your local repository, but it also maintains a local copy of the remote repository. git fetch brings your local copy of the remote repository up to date. For example, if your remote repository is GitHub - you may want to fetch any changes made in the remote repository to your local copy of it the remote repository. This will allow you to perform operations such as compare or merge. 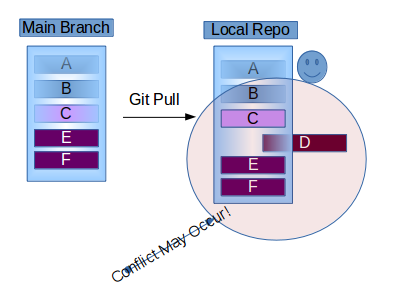 git pull on the other hand will bring down the changes in the remote repository to where you keep your own code. 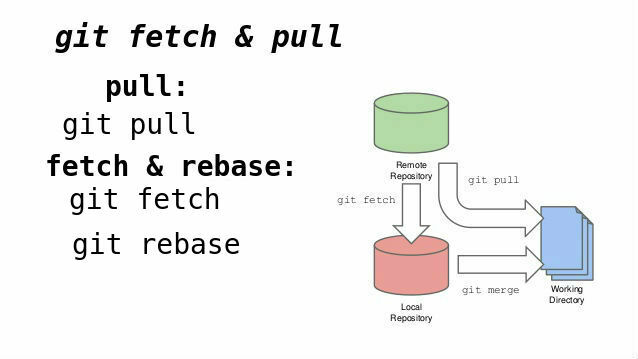 Typically, git pull will do a git fetch first to bring the local copy of the remote repository up to date, and then it will merge the changes into your own code repository and possibly your working copy. Actually Git maintains a copy of your own code and the remote repository. The command git fetch makes your local copy up to date by getting data from remote repository. The reason we need this is because somebody else might have made some changes to the code and you want to keep yourself updated. The command git pull brings the changes in the remote repository to where you keep your own code. Normally, git pull does this by doing a ‘git fetch’ first to bring the local copy of the remote repository up to date, and then it merges the changes into your own code repository and possibly your working copy. Trying to be clear and simple. The git pull command is actually a shortcut for git fetch followed by the git merge or the git rebase command depending on your configuration. You can configure your Git repository so that git pull is a fetch followed by a rebase. will fetch code from repository and rebase with your local... in git pull there is possibility of new commits getting created. eg: i am going to fetch from server master and rebase it in my local master. it will fetch server changes from origin. and it will be in your local until you rebase it on your own. we need to fix conflicts manually by checking codes. this will rebase code into local. before that ensure you're in right branch. Not the answer you're looking for? Browse other questions tagged git git-pull git-fetch or ask your own question. what is the difference between git pull , git fetch and git rebase? Difference between git merge and git fetch? Why doesn't git fetch update local branch? 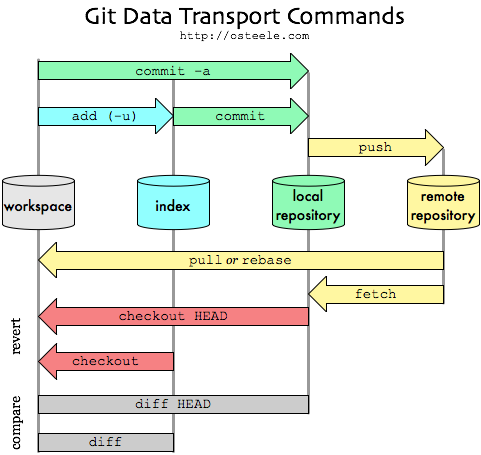 What is a very descriptive and easy to understand description between git fetch and git pull? When is it better to git fetch vs git pull?